I never expected the essence of a city can be tasted and it's really tasty! 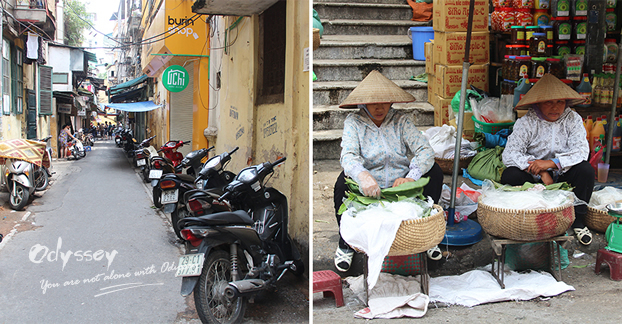 Whenever you wish to try something authentic, tasty in Hanoi, the local direct you to Old Quarter, an important district that's freighted with a prosperous history of more than 1,000 years. It is also called 36 Streets (as consisting of 36 member streets), with diverse business lines: silverware, silks, blacksmith, bamboo products and many others. As a matter of fact, streets have already outnumbered 36, but the name lives and represents the eternal soul of the city. For foodies, the weaving and winding lanes brood rich street food culture that they can experience nowhere else. 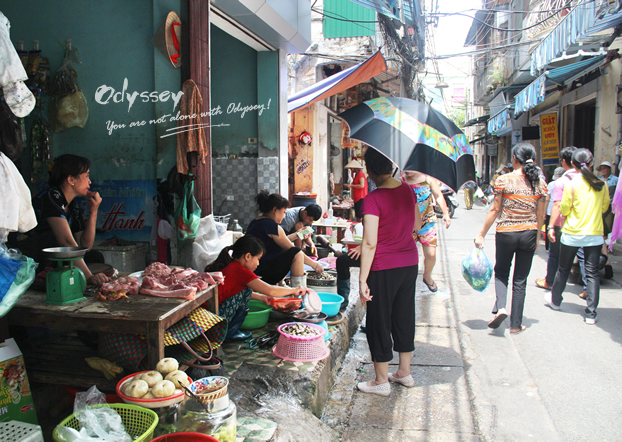 If you are one of the avid food explorers, you'll love how it will be to hit the street and discover true flavors of Vietnam on a Hanoi Walking Food Tour. A typical small eats street in the Old Quarter. The tour is a personalized one (yes you can tailor-make the trip beforehand! 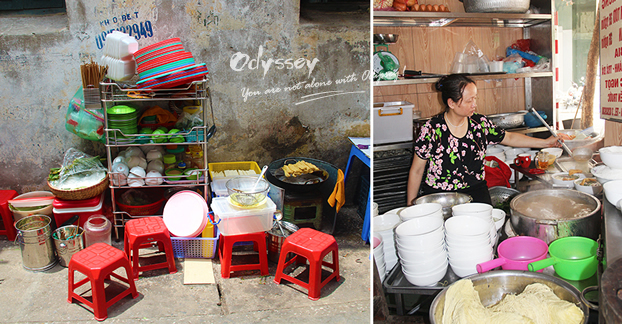 ), and normally takes four hours, during which Odyssey local tour guide takes foodies walking through the maze of bustling streets that are permeated with the typical scenes and sounds of Hanoi, introducing them to exotic snacks and try each at their own pace. Concerning about sanitation? The selection of food stalls and restaurants are based on reputation and the guide's personal experience, which means the local frequent them too! 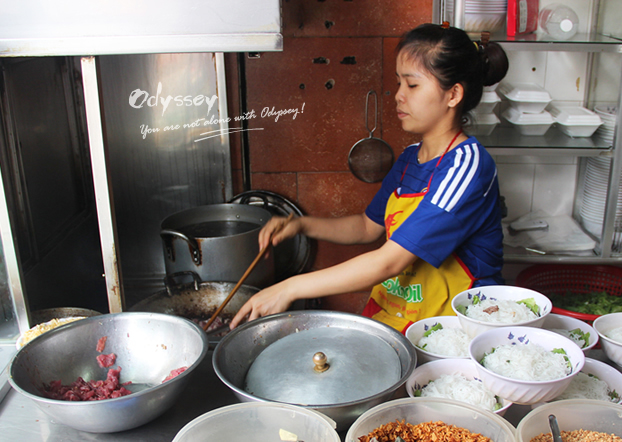 It is suggested take the tour in the morning when chefs serve early customers and offer sizzling Vietnamese breakfast; or venture out in the afternoon, with a hungry stomach, then stuff yourself. Us, sitting by the small round table at a dessert stall and enjoying yum sweet soups. Inspired by French and Chinese cuisine, the Vietnamese combine both and create something really unique: fresh ingredients, minimal use of oil and reliance on herbs and vegetables. The cooking techniques mainly focus on simmering, stew, boiling, salad.  That way, Vietnamese food is regarded as one of the healthiest cuisines in the world. Ingredients to make light but flavorful Vietnamese food. 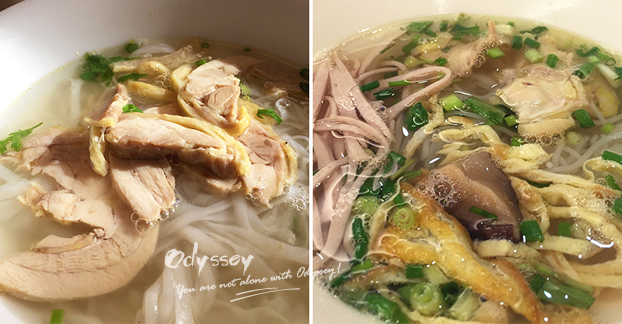 Of the north, pho (rice noodle soup) is one of the most popular dishes. Traditionally, a bowl of pho is served with either beef brisket or chicken meat and bones that are part of the broth, depending on the customer's choice. To better cater to worldwide appetizers, pork, duck meat and things alike are also becoming common characters. My favorite would be pho ga (chicken), the key to which is the crystal clear broth - all the impurities that float to the top while cooking is skimmed off. In addition to cuts of meat, the second element of the pho is garnished like fresh herbs and vegetables. Givens are placed in a buffet way: add some fish sauce and chilli, squeeze a lime, then let noodles play their magic role. Noodle is a good choice for meals in Vietnam. Rice products are most people's diet preference as the north yields massive rice volume, and have their roles in at least one meal of every Vietnam tour. 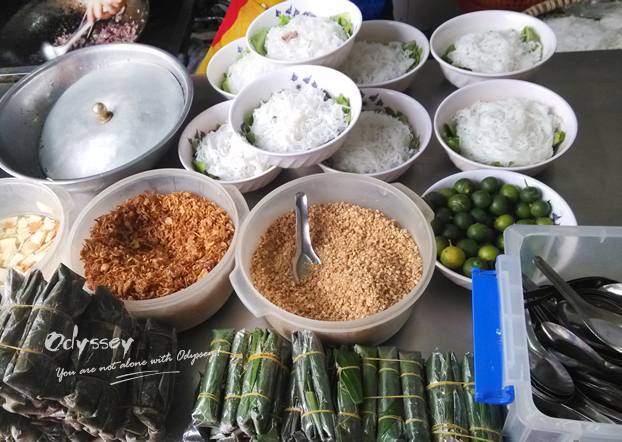 Amongst them, sticky rice composes of the most common meal and snacks, including Banh Trung (sticky rice cake), Banh Ran (sticky rice pancake), Banh Cuon (rolled sticky rice cake) and Xoi (sticky rice with pork). Raw young sticky rice sold in the street. Soft and delicate Banh Cuon (rolled sticky rice cake) stuffed with pork and wood-ear mushrooms, topped with fried prawns and served with dipping sauce. 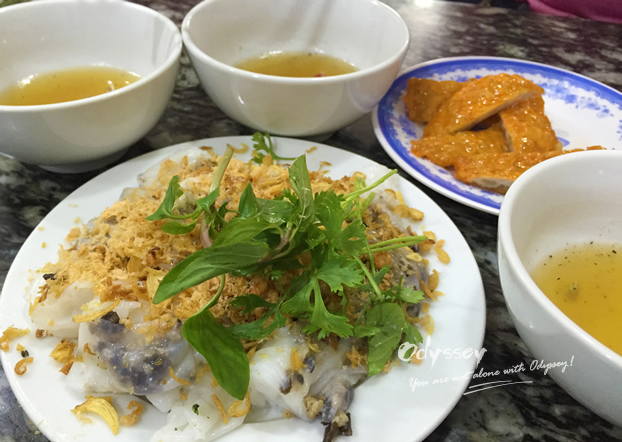 Though Old Quarter sees no Michelin starred restaurants, your taste buds are easy to be teased by the fantastic flavor and aroma of dishes found in some small eateries, and calling them "hidden gems" is never exaggeration. One of the must-go is Bun Bo Nam Bo, which pleased CNN and ranks high on the list of restaurants in Hanoi on TripAdvisor. The Certificate of Excellence says a lot about the popularity of the restaurant. 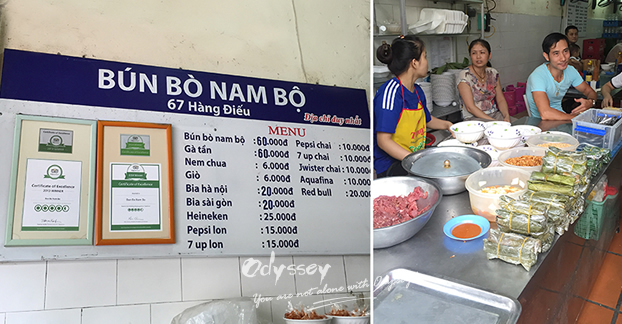 Bun Bo Nam Bo is also the name of the dish that they serve: dry vermicelli with stirred beef. 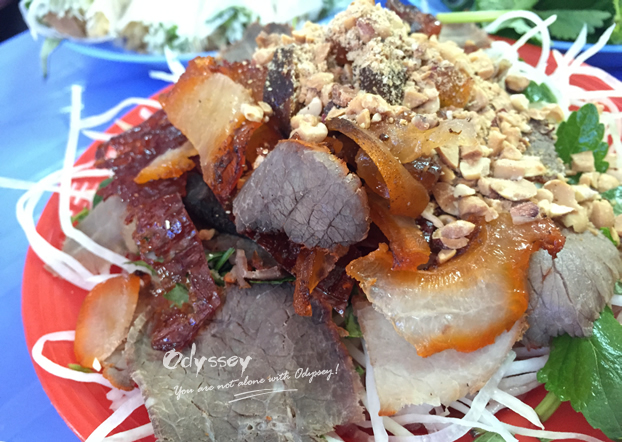 Different from noodle soup, this dish underlines the refreshing taste and the tender beef, which is well marinated. Do yourself a favor by mixing in bean sprouts, Vietnamese Pickles, lemongrass and fried prawns for a filling treat. It is amazing to sit next to the local and enjoy the inexpensive food with a can of beer - the bill is under 5 USD! Left: Bun Bo Nam Bo, a detox dish in summer days. Right: Mix in the ingredients and there you go! It is fun to watch the efficiency with which they prepare many bowls of noodles in a very short time. 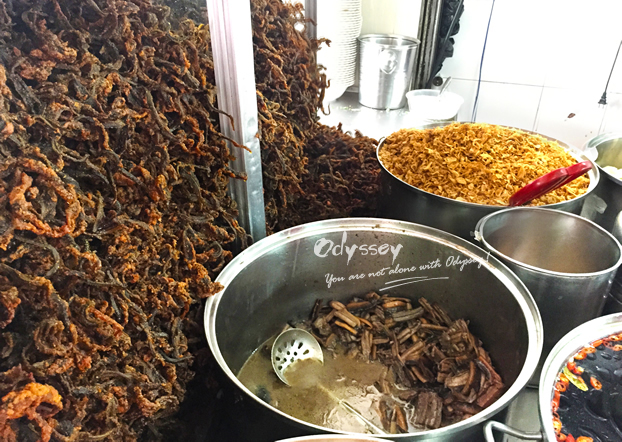 For those who are seeking the most eyebrow-raising food items, the Old Quarter has got something for them too: deep-fried swamp eels, silkworm carcasses, farm rats, and even baluts! A balut is a fertilized duck embryo cooked and eaten in the shell. Oops, did I just hear vomit? Swamp eels can be cooked in many forms, including deep fry, steam, fry, and stew. 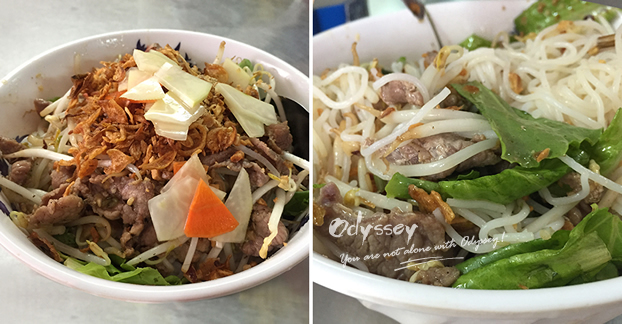 After sampling these classic foods, it's the time for dessert: a small plate of Vietnamese pork salad or dessert soup (chè), a specialty cooked with sweet beverage and puddings. The pork salad is perfect to serve for lunch or dinner in the hot summer. 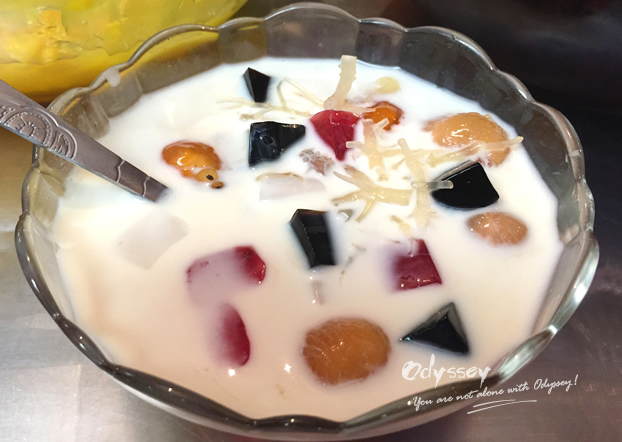 Varieties of chè are often prepared with black-eyed peas, tapioca, jelly, fruit and coconut cream. 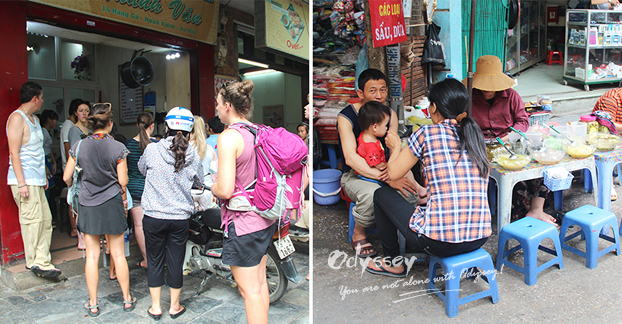 As our bellies began to fill, we visited the street side market selling various chillis and spices that make Vietnamese food so delicious. 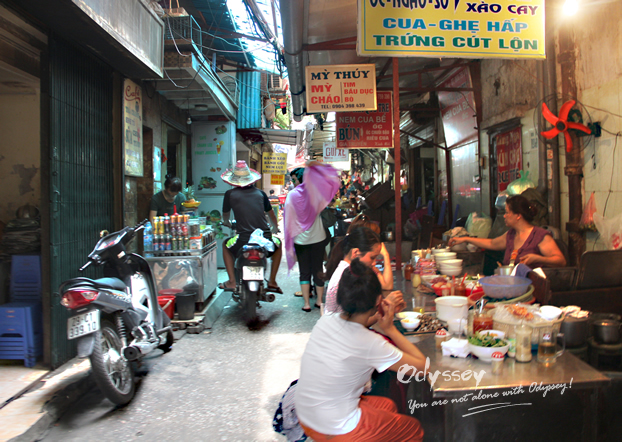 Led by the Odyssey guide, breathe in the aromatic scents, hear cooking stories and learn unique food cultures. 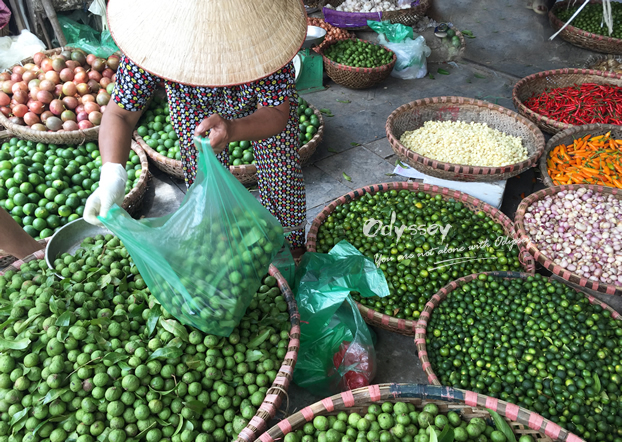 Lime, garlic, lemongrass, chilli, basil & sweet basil are commonly used in Vietnamese cuisine. It'd be nice to end the tour with beer/coffee: take in a spectacular sunset view of Hoan Kiem Lake with either a can of Vietnamese brew or a cup of Vietnamese iced coffee in a secret café. As you watch people passing by the flooding motorbikes, a thought comes, lingering long, and you realize after returning home, you're going to miss this amazing place like there is no tomorrow. 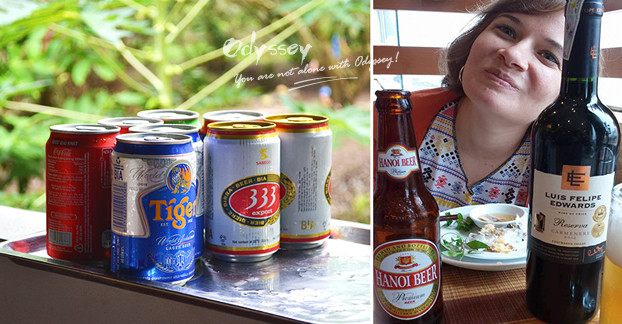 Right: Tough choice for Odyssey guest Veronica Lee Cooper - Hanoi Beer or Chilean Carmenere? 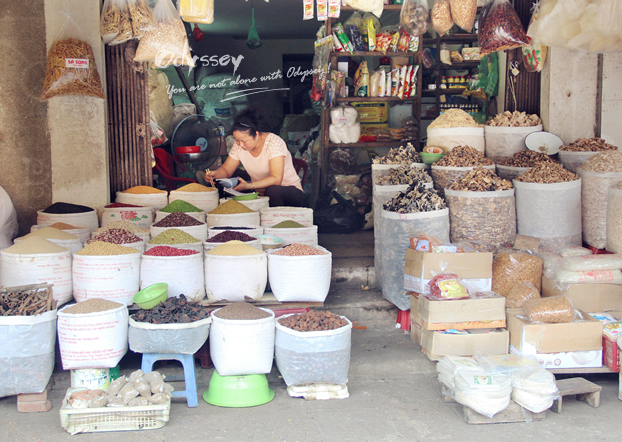 A neighboring small-sized wet market. 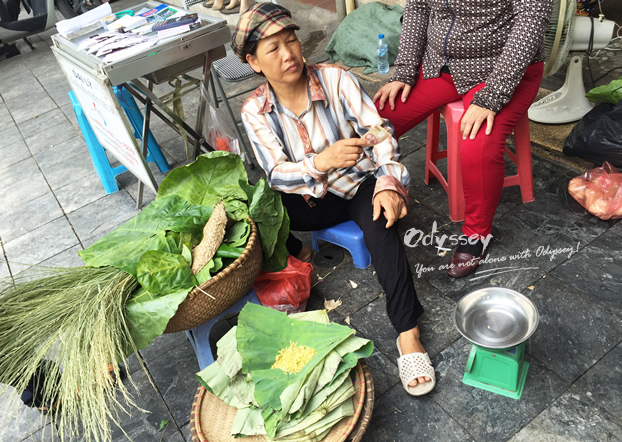 Right: Ladies selling sticky rice rolls. Left: Tourists are getting interested in the local taste. Right: A simple street eats stall. Left: The whole package of an open-air food stand. 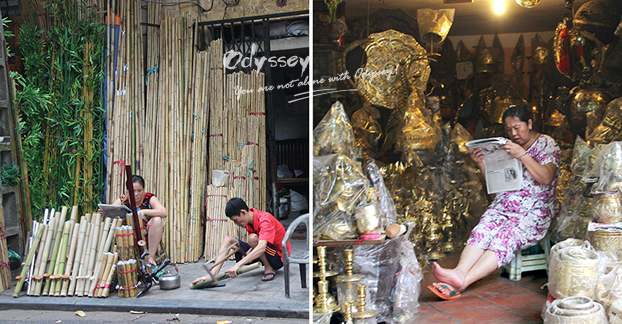 Right: Vietnamese lady busy preparing rice noodles. Left: Making bamboo tube pipes for smoking. Right: Lady owner reading newspaper at her ritual instruments shop. 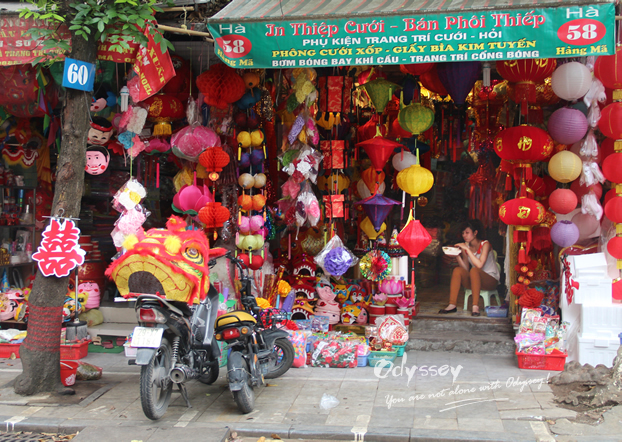 Shop items related to traditional Vietnamese festivals.